After the war ended, June remained in Seattle where she met her future husband, Robert Perkins, who was home from the war. Their first meeting was on a blind date. They fell in love, married, and returned to Chewelah where Robert had been raised. Their first child, Michael, arrived, and a year later their daughter, Judith, was born. The family moved back to Seattle for a short while but soon returned to Chewelah where a third child, Patricia, was born. 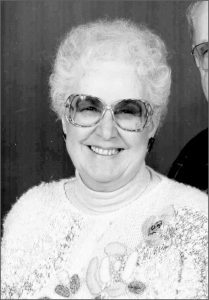 June was a wonderful homemaker, devoted mother and also donated her time as a Cub Scout leader and den mother to many Chewelah boys. She loved to cook and bake; her family and friends recall her creative meals and amazing desserts. She was also a great seamstress and made all of her girls’ clothing. Eventually, she entered the workforce first as a secretary for Salsbury Insurance and then as a bookkeeper for three consecutive John Deere dealerships. June is survived by her sisters, Faye Howell and Pauline Yunker (Warren), and a brother Paul Moyer, all of whom reside in Emmett, Idaho, her son, Mike Perkins (Judi), her daughters Judith Hoel (Alfred Reiner) and Patricia Kaiser (Tim) all of whom have never left Chewelah, much to her delight. She will also be remembered by four grandchildren, Chris and Robbie Hoel, and Janelle Geer and Deanne Gatfield, and five great grandchildren, Nells and Kellan Hoel, Mykalah and Michelle Geer, and Destry Gatfield. June had numerous nieces and nephews both in Chewelah and Emmett. She was blessed to have the friendship and support of Joanne Sweat, her caregiver of three years, and for a short time, Martha Frizzell. A memorial service and celebration of life for June will be held in the spring. She was dearly loved by her family and friends and enjoyed the comfort of her faith throughout her long life of 93 years. She is now home with her Lord and Savior, Jesus Christ.